KVERT reported that during 30 October-6 November seismic activity from Koryaksky did not exceed background levels. Fumarolic activity was noted on 29 October and during 4-5 November. The Level of Aviation Color Code was lowered to Green. During March-18 April 2009 (BGVN 34:03) seismicity and volcanism continued at Karymsky, and ash plumes were detected for hundreds of kilometers. This report discusses the interval May-October 2009, with some discussion of earlier seismicity. The key conclusion for this new interval is that seismicity has not stopped and occasional, though smaller ash plumes continued. In the mid-May 2009 volcanic and seismic activity decreased considerably. The active fumarole on the NW slope produced gas-steam plumes, but no longer contained appreciable ash (figure 8). Figure 8. Gas-steam emission seen on the NW side Koryaksky on 11 May 2009. The white snow on the volcano confirms the virtual absence of any ash in the plume. Photo by A. Socorenko. On 2-3 June 2009, observers again saw small areas of snow that were dark gray, indicating some increased ash content. On 15-16 August 2009 instruments began to register a spasmodic volcanic tremor; seismicity increased, and on 17 August ash fell to the SW, forming a deposit 1 mm thick (figure 9). Figure 9. Ash plume from a vent on NW slope of Koryaksky. Snow on the slope covered fresh ashfall. Dark area around vent is due to local heating and melting of snow cover. Photo taken on 18 August 2009 by S. Chirkov. Seismic analysis. Seliverstov (2009) analyzed seismicity for May 2008 to 10 June 2009, looking at events larger than Ks 4 (Class 4 earthquakes, roughly those larger than M ~ 1.2) and found a spatial and temporal pattern to this stronger seismicity. During March 2008 a prominent swarm of earthquakes was often centered at about 5-10 km depth. Smaller earthquakes were also seen around that time, several at ~ 12 km depth, and some at 15 km depth. This stronger seismicity then waned for several months until late June. During August 2008 to 10 June 2009, earthquakes were numerous, often centered near 5 km depth. Figure 10 shows a representative set of hypocenters during 3 January 2009-6 November 2009. The pattern shown was similar to that seen during various months during 2008 through mid-2009. Other patterns during 2008 to mid-2009 included intervals where epicenters dipped, as noted in the analysis presented by Seliverstov (2009). Despite decreased volcanic activity, the elevated seismicity remained until at least 10 June 2009. Figure 10. Seismicity of Koryaksky (and Avachinsky, to the SE) recorded during May-October 2009. Map shows location and depths of earthquakes (white line is cross-section AB. Cross-section shows hypocenters within 20 km depth. Courtesy of the Kamchatka Branch of the Geophysical Service, Russian Academy of Sciences (KB GS RAS). The number of earthquakes recorded within 10-15 km of the summit during January through October 2009 by the KB GS RAS peaked in April with 422 events, and again in August with 245 events. Otherwise, the interval commonly had monthly totals of 100-200 with the lowest during January (59 events) and October (37 events). References. Seliverstov, N., 2009, The activity Koryaksky volcano, Kamchatka, Vestnik KRAUNC, Earth Science Series; Petropavlovsk-Kamchatsky, 2009, v. 13, p.7-9 [ISSN 1816-5524]. In Russian. Information Contacts: Kamchatka Volcanic Eruptions Response Team (KVERT), Far East Division, Russian Academy of Sciences, 9 Piip Blvd., Petropavlovsk-Kamchatsky, 683006, Russia (URL: http://www.kscnet.ru/ivs/); Kamchatka Branch of the Geophysical Service of the Russian Academy of Sciences (KB GS RAS), Sergey Senukov, Russia (URL: http://www.emsd.ru/); Alexander Socorenko and Sergei Chirkov, IV&S FED RAS; Tokyo Volcanic Ash Advisory Center (VAAC), Tokyo, Japan (URL: http://ds.data.jma.go.jp/svd/vaac/data/). KVERT reported that activity from Koryaksky decreased on 27 August and remained low through 4 September. Gas-and-steam plumes rose to an altitude of 3.7 km (12,100 ft) a.s.l. and drifted in multiple directions. Tremor was detected by the seismic network during 27-28 August and 1 September. The Aviation Color Code level was lowered to Yellow. KVERT reported that seismic activity from Koryaksky was slightly above background levels during 20-23 August and at background levels during 24-27 August. Ash plumes were seen in satellite imagery drifting more than 385 km in easterly directions. Gas-and-steam plumes containing ash that rose to an altitude of 3.7 km (12,100 ft) a.s.l. were seen drifting in multiple directions during 26-27 August. The Level of Concern Color Code remained at Orange. KVERT reported that during 14-21 August seismic activity from Koryaksky was slightly above background levels. During 13-16 August, gas-and-steam plumes rose to altitudes of 3.5-5 km (11,500-16,400 ft) a.s.l. Based on visual observations during 16-20 August, gas-and-steam plumes containing ash rose to altitudes of 3.5-4.2 km (11,500-13,800 ft) a.s.l. and drifted in multiple directions. Ash plumes were also seen in satellite imagery, drifting 215 km E and W. On 23 August, a probable ash plume detected in satellite imagery drifted 50 km ESE. During 24-25 August, seismicity increased; more than 100 earthquakes were recorded. The Level of Concern Color Code remained at Orange. KVERT reported that during 10-12 August seismic activity from Koryaksky was above background levels. On 12 August, an ash plume seen on satellite imagery drifted 180 km ESE at an altitude of 3.5 km (11,500 ft) a.s.l. During 15-16 August seismic activity increased, and seismic tremor was detected. On 16 August, a gas plume with a small amount of ash was seen on satellite imagery drifting 80 km WNW. During 17-18 August, an ash plume rose to an altitude of 4 km (13,100 ft) a.s.l. Ashfall up to 1 mm thick was reported in areas to the SW. The Level of Concern Color Code was raised to Orange. Moderate to strong fumarolic activity at Koryaksky has been reported by KVERT in recent weeks. Satellite data showed a weak thermal anomaly over the volcano 11 and 13 June. The Level of Concern Color Code remained at Yellow. During 17-25 April, KVERT reported that seismic activity at Koryaksky was above background levels and weak volcanic tremor was detected. Gas plumes containing a small amount of ash drifted in multiple directions during 17-18 April. On 17 and 18 April, gas-and-ash plumes were also seen on satellite imagery and drifted 100 km NE. On 20 April, a sulfur dioxide plume extended about 15 km from the volcano. During 26-28 April, seismic activity decreased to background levels; tremor was occasionally detected. The Level of Concern Color Code was lowered to Yellow. During 10-17 April, KVERT reported that seismic activity at Koryaksky was above background levels. Gas-and-ash plumes were seen on satellite imagery and drifted 30-680 km in multiple directions. The Level of Concern Color Code remained Orange. Based on information from the Yelizovo Airport and analysis of satellite imagery, the Tokyo VAAC reported that during 18 and 21 April ash plumes rose to altitudes of 3.7-4.6 km (12,000-15,000 ft) a.s.l. and drifted S, SW, W, and NE. KVERT reported that seismic activity at Koryaksky was elevated on 7 and 8 April and at background levels on the other days during 3-10 April. Weak volcanic tremor was detected on 7 April. Gas plumes containing a small amount of ash originating from two vents on the NW flank rose to an altitude of 5.4 km (17,700 ft) a.s.l. and drifted NE, NW, SE, and SW during the reporting period. Gas-and-ash plumes were also seen on satellite imagery and drifted 290 km in multiple directions. On 11 April, KVERT staff reported ashfall in Petropavlovsk-Kamchatsky (30 km S). Ash accumulated to 0.1-2.5 cm thickness near the Institute of Volcanology and Seismology (IVS) FED RAS. The Level of Concern Color Code remained Orange. KVERT reported that seismic activity at Koryaksky was at background levels during 27 March-3 April. Gas plumes containing a small amount of ash rose to an altitude of 4 km (13,200 ft) a.s.l. and drifted E, SE, S, and W during the reporting period. During 27-28 and 31 March, and 1-2 April, gas-and-ash plumes were also seen on satellite imagery and drifted 313 km E, in southerly directions. The Level of Concern Color Code remained Orange. KVERT reported that seismic activity at Koryaksky was at background levels during 20-27 March. Gas plumes containing a small amount of ash rose to an altitude of 4 km (13,200 ft) a.s.l. and drifted S, SE, W and NW during the reporting period. On 25 and 26 March, gas-and-ash plumes were also seen on satellite imagery and drifted 225 km SE. The Level of Concern Color Code remained Orange. Based on information from the Yelizovo Airport and KEMSD, and analysis of satellite imagery, the Tokyo VAAC reported that during 26-27 and 29 March ash plumes rose to altitudes of 3-3.7 km (10,000-12,000 ft) a.s.l. and drifted S, SW, and W.
KVERT reported that seismic activity at Koryaksky was elevated on 13 March and at background levels on the other days during 14-20 March. Observers reported that gas plumes containing a small amount of ash rose to an altitude of 4 km (13,200 ft) a.s.l. and drifted in easterly directions during the reporting period. The plumes were also seen on satellite imagery drifting 140 km away from the volcano. Ash was emitted from the upper fumarolic vent and covered the flanks. The Level of Concern Color Code remained Orange. KVERT reported that seismic activity at Koryaksky was elevated on 6 and 8 March and at background levels on the other days during 7-13 March. Observers reported that gas plumes containing a small amount of ash rose to an altitude of 4 km (13,200 ft) a.s.l. and drifted in multiple directions during the reporting period. The plumes were also seen on satellite imagery. Ash deposits were seen near the volcano. The Level of Concern Color Code remained Orange. Based on information from the Yelizovo Airport and KVERT, the Tokyo VAAC reported that during 11-12 and 15 March ash plumes rose to altitudes of 3-5.2 km (10,000-17,000 ft) a.s.l. and drifted S, SE, E, and N.
KVERT reported that seismic activity at Koryaksky was above background levels on 3 March and at background levels on the other days during 27 February-6 March. Observers reported that during 3-5 March gas plumes containing a small amount of ash rose to an altitude of 3.7 km (12,100 ft) a.s.l. and drifted ENE, E, and SE. The plumes were also seen on satellite imagery. Ash deposits were seen at the summit, and on the N flank at a thickness of about 4 cm. Ash deposits 1-2 mm thick had accumulated in an area between Koryaksky and Avachinsky volcanoes. A weak new fumarole was seen in the crater. The Level of Concern Color Code remained Orange. Based on information from the Yelizovo Airport, the Tokyo VAAC reported ash on 8 March. On 10 March, an ash plume rose to an altitude of 3.7 km (12,000 ft) a.s.l. and drifted SE. KVERT reported that during 25 February-4 March seismic activity at Koryaksky was at background levels. Observers reported that during 3-4 March gas plumes containing a small amount of ash rose to an altitude of 3.7 km (12,100 ft) a.s.l. and drifted more than 200 km ENE. Ash deposits were seen at the summit. Ash deposits 1-2 mm thick accumulated in an area between Koryaksky and Avachinsky volcanoes. The Level of Concern Color Code was raised to Orange. KVERT reported that during 26 December-7 January seismic activity at Koryaksky was at background levels. Observers reported that during 30-31 December gas-and-steam plumes possibly containing a small amount of ash drifted along the surface of the NW flank. During 6-7 January gas-and-steam plumes drifted SW. The Level of Concern Color Code was lowered to Yellow. KVERT reported that during 23-24 December gas-and-steam plumes from Koryaksky containing a small amount of ash were detected on satellite images. On 24 December observers from the Nalychevo valley reported that a dark plume rose 200-300 m from a fumarolic vent (about 3 km a.s.l.) on the NW flank of Koryaksky and a boom was heard later that night. Ash plumes detected in satellite imagery on 25 December drifted about 200 km NE. On 28 December, KVERT raised the Alert Level to Orange and reported that a Vulcanian eruption was occurring. Ash plumes rose to an altitude of 4 km (13,200 ft) a.s.l. and drifted NW. According to a press report, a M 3.6 earthquake followed by ~2 hours of seismicity at ~6 km depth was detected at Koryaksky. During 6 March-8 April there was a significant increase in seismic activity. Most of the 43 seismic events recorded took place at a depth of 5 km beneath the volcano. The three strongest earthquakes occurred on 4 April. The level of seismic activity beneath the volcano decreased during the second week of April; only a few weak earthquakes were registered at depths of 5-10 km. On 8 April the Level of Concern Color Code was upgraded to Yellow from Green, indicating that an eruption is possible with little or no additional warning. The increased level of seismicity . . . continued to be recorded beneath the volcano (1-2 earthquakes/day) through the end of April. These high-frequency tectonic events (with some unusual characteristics) occurred at 2-12 km depth with a maximum magnitude of 2. This type of event at this depth range has not been identified since the present seismic net on the volcano was installed in 1982. Although the seismic activity continued into early May at a rate of 1-2 earthquakes/day, the lack of additional increase led to the downgrading of the Level of Concern Color Code back to Green. Seismicity beneath the Koryaksky-Avachinsky area increased above background levels in mid-May to a rate of 6-9 earthquakes/day. During a 2-day period, 18 earthquakes were detected at ~12 km (11 May) and 0-9 km depth (12 May). Seismicity had returned to background levels by 26 May. Seismicity was at or a little above normal background levels in late July and August. Historical activity at Koryaksky has been largely fumarolic, although a weak explosive eruption took place in 1956-57 from the summit crater and a radial fissure on the upper NW flank. Information Contacts: Tom Miller, Alaska Volcano Observatory (AVO), 4200 University Drive, Anchorage, AK 99508-4667, USA; Vladimir Kirianov, Kamchatka Volcanic Eruptions Response Team (KVERT), Institute of Volcanic Geology and Geochemistry, Piip Ave. 9, Petropavlovsk-Kamchatsky, 683006, Russia. Seismicity was at normal background levels from September 1996 through mid-December 1997; the period of normal activity began in July 1996 (BGVN 21:09). However, during 22-29 December, seismicity was reported above background level. Information Contacts: Vladimir Kirianov, Kamchatka Volcanic Eruptions Response Team (KVERT), Institute of Volcanic Geology and Geochemistry, Piip Ave. 9, Petropavlovsk- Kamchatskiy 683006, Russia; Tom Miller, Alaska Volcano Observatory (AVO), a cooperative program of a) U.S. Geological Survey, 4200 University Drive, Anchorage, AK 99508-4667, USA (URL: http://www.avo.alaska.edu/), b) Geophysical Institute, University of Alaska, PO Box 757320, Fairbanks, AK 99775-7320, USA, and c) Alaska Division of Geological & Geophysical Surveys, 794 University Ave., Suite 200, Fairbanks, AK 99709, USA. Our last report for Koryaksky was BGVN 22:11, discussing seismicity in 1997. According to a Russian Information Agency Novosti press report, on 12 December 2003 instruments detected an M 3.6 earthquake followed by ~ 2 hours of seismicity at ~ 6 km depth beneath Koryaksky. A cyclonic weather system over the peninsula obstructed visual observations. Information Contacts: Russian Information Agency Novosti (URL: http://russia-insider.com/). Koryaksky, which had lacked fumarolic activity during the last ~ 51 years, began steaming after seven months of local seismicity. The increased seismicity became prominent in March 2008 (figure 1) and the first steaming was recorded on 6 October 2008. The first fumarole vent to appear was located at ~ 3 km elevation on the upper NW slope. Koryaksky, a large snow-laden stratovolcano, forms the most prominent feature of the Avachinskaya volcano group. Episodes of elevated seismicity have previously occurred, as reported in December 2003 (BGVN 28:12). Figure 1. Seismicity of Koryaksky (and Avachinsky, to the SE) recorded during February 2008-February 2009. a) A map of the region showing location and depths of earthquakes. The white line is trace of cross section AB; a 35-km-diameter circle encloses epicenters of earthquakes plotted in c). b) Histogram showing daily earthquakes with respect to time; ascending curve is the cumulative number of earthquakes (reaching a total of 970 for the interval). c) Hypocenters projected onto the vertical plane of cross section AB. Courtesy of KB GS RAS. Only two earthquakes struck on 23 December 2008, both at ~ 5 km depth. Observers also heard a booming sound from the volcano at night. NOAA 17 satellite data collected at 2357 UTC on 23 December revealed that a dense ash plume extended over 60 km laterally, and an ash-poor ash plume continued beyond that for another 140 km NE. During 24-25 December observers in the Nalychevo valley saw a dark ash column rise about 200-300 m from the upper NW-flank vent. On 28 December 2008 moderately explosive vulcanian-type eruptions occurred. Ash plumes rose to ~ 4 km altitude and extend NW. Observers also saw significant fumarolic activity at two vents. During a break in cloud cover on 30-31 December observers saw gas-and-steam plumes, which were thought to contain small amounts of ash. They drifted along the surface of the NW flank, some reaching ~ 4 km altitude. A 2 January KVERT report noted background seismicity during 31 December-6 January, with 1-7 volcanic earthquakes per day and possible episodes of tremor during 30 December to 1 January. During 6-8 January 2009 strong fumarolic activity continued. According to visual data, gas-steam plumes extended SW from three vents. Gray deposits were visible at the area near the summit. Figures 2 and 3 illustrate the scene on 8 and 10 January 2009. Strong fumarolic activity also prevailed on 14 and 18-19 February 2009. Figure 2. Gas and steam escaping from Koryaksky on 8 January 2009. Three vents on the NW slope trace an older fissure. Photo by Alexandr Socorenko. Figure 3. View of Koryaksky looking W from Petropavlovsk on 10 January 2009. The photo was taken from the roof of Institute of Volcanology and Seismology. Photo by Alexandr Socorenko. KVERT issued reports on 4 March 2009 noting increased activity, with some ash-bearing plumes extending over 200 km to the NE-ENE on 3-4 March. For the previous week, seismicity was again at background. Ash deposits were identified both on the summit and in the saddle to Avachinsky. At the latter area on 4 March, the deposits reached 1-2 mm thickness. In a 5 March report, KVERT noted plumes containing small amounts of ash rising to 3.7 km and extending over 220 km. They blew to the ENE, E, and SE on 3-5 March. Koryaksy's N flank contained fresh ash deposits ~ 4.0 cm thick. The crater contained a weak, new fumarole. Information Contacts: Kamchatka Volcanic Eruptions Response Team (KVERT), Institute of Volcanology and Seismology (IV&S) Far East Division, Russian Academy of Sciences (FED RAS); Kamchatka Branch of the Geophysical Service of the Russian Academy of Sciences (KB GS RAS), Piip Ave. 9, Petropavlovsk-Kamchatsky, 683006, Russia (URL: http://www.kscnet.ru/ivs, http://www.emsd.ru/~ssl/monitoring/main.htm); Alexander Sokorenko, IV&S; Tokyo Volcanic Ash Advisory Center (VAAC), Tokyo, Japan (URL: http://ds.data.jma.go.jp/svd/vaac/data/). Koryaksky ended ~ 51 years without fumarolic activity with an eruption late in 2008. Activity that began on about 24 December 2008 continued through 5 March 2009 (BGVN 34:01). Fresh ash deposits in early March could be seen on both the summit, E, and SSW slopes of Koryaksky, and on the NNW slope of Avachinsky (figure 4). Between the two volcanoes, the early March ash deposits reached 1-2 mm thick. Figure 4. 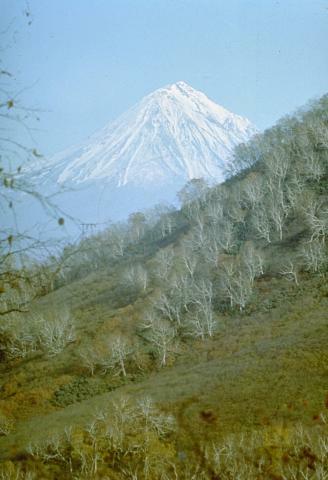 (top) Ash plume from Koryaksky (peak at left) extending to the ESE in an eruption that left deposits of ash on Koryaksky and Avachinsky (peak at right). (bottom) Ash deposits on Koryaksky on the same date. Both photos from the town of Petropavlovsk-Kamchatsky on 7 March 2009 by A. Sokorenko. Numerous plumes were observed during this reporting interval, 6 March to mid-April 2009 (table 1). A report from 8-14 April noted the presence of two vents on the NW flank. A small SO2 plume was noted on 20 April. Seismicity often fluctuated, with considerable intervals at background level punctuated by intervals where it was elevated. Occasional tremor was recorded, but it was often weak (low amplitude). Table 1. A compilation of eruptive plume behavior from Koryaksky based on information from the Yelizovo Airport, KVERT, and KEMSD (the Kamchatkan Experimental and Methodical Seismological Department). The data were initially compiled by the Tokyo VAAC in reports for aviators in an effort to avoid aircraft encounters with volcanic ash. Few of the plumes were considered ash rich, most were considered as gas plumes containing small amounts of ash. Courtesy of the Tokyo VAAC. 18 Mar-24 Mar 2009 E, S, SE, W, and NW Gas plumes containing a small amount of ash rose to 4 km. On satellite imagery plumes drifting up to 140 km away from the volcano. Ash was emitted from the upper fumarolic vent and covered the flanks. 08 Apr-14 Apr 2009 NE, NW, SE, and SW Gas plumes containing a small amount of ash originating from two vents on the NW flank rose to an altitude of 5.4 km. Plumes were also seen on satellite imagery and drifted 290 km in multiple directions. On 11 April, KVERT staff reported ashfall in Petropavlovsk-Kamchatsky (30 km S). Ash accumulated to 0.1-2.5 cm thickness near the Institute of Volcanology and Seismology (IVS). 15 Apr-21 Apr 2009 Multiple directions, including S, SW, W, NE Gas-and-ash plumes to 3.7-4.6 km altitude; on satellite imagery (drifting 30-680 km). KVERT reported that seismic activity at Koryaksky was elevated on 6 and 8 March and at background levels during 7 and 9-13 March. Observers reported that gas plumes containing a small amount of ash rose to an altitude of 4 km and drifted in multiple directions during the week of 11-17 March. The plumes were also seen on satellite imagery. An eruption on 9 April 2009 followed an increase in the number of local earthquakes and tremor during the previous month (figure 5). The total number of earthquakes during February 2008-December 2008 was 717. That was less than the total of 766 for the first four months in 2009, which were as follows: January, 58; February, 195; March, 239; and April, 274. High level gas-steam and ash emissions occurred during March-April. Some plumes extended more than 200 km (table 1). Figure 5. Seismicity of Koryaksky (and Avachinsky, to the SE) recorded during January-April 2009. Map (left) shows location and depths of earthquakes (white line is cross-section AB; 20-km-diameter circle encloses epicenters of earthquakes plotted on histogram. Cross-section shows hypocenters projected onto the vertical plane along AB. Histogram shows daily Koryaksky earthquakes with respect to time; ascending curve is the cumulative number of earthquakes (reaching a total of 652 for the interval). Courtesy of the Kamchatka Branch of the Geophysical Service of the Russian Academy of Sciences (KB GS RAS). On 9 April a photo was taken showing a strong ash plume emerging from fissures in the glacier on Koryaksky's NW flank. On 13 April a flight over the area enabled scientists to measure temperature around two vents (figures 6 and 7). Temperatures of the vent areas reached 400°C. This situation was attributed to glacial instability owing to melting parts of the glacier near the vents. Figure 6. A photo taken from Petropavlovsk-Kamchatsky (~35 km N of the volcano) illustrating powerful ash-bearing emissions from the NW flank of Koryaksky. Photo taken by Sergei Ushakov 9 April 2009. Figure 7. 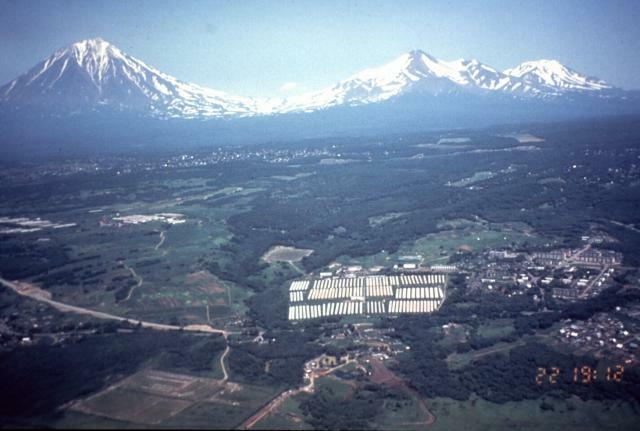 A photo showing two vents on the NW flank of Koryaksky. The upper plume is ash rich, the other contains only gas and steam. Photo taken by Alexander Sokorenko on 18 April 2009. Information Contacts: Kamchatka Volcanic Eruptions Response Team (KVERT), Institute of Volcanology and Seismology (IV&S), Far East Division, Russian Academy of Sciences (FED RAS), Piip Ave. 9, Petropavlovsk-Kamchatsky, 683006, Russia (URL: http://www.kscnet.ru/ivs/); Kamchatka Branch of the Geophysical Service, Russian Academy of Sciences (KB GS RAS), Piip Ave. 9, Petropavlovsk-Kamchatsky, 683006, Russia (URL: http://www.emsd.ru/~ssl/monitoring/main.htm); Alexander Sokorenko and Sergey Ushakov, IV&S; Kamchatkan Experimental and Methodical Seismological Department (KEMSD), GS RAS, Russia; Tokyo Volcanic Ash Advisory Center (VAAC), Tokyo, Japan (URL: http://ds.data.jma.go.jp/svd/vaac/data/). The large symmetrical Koryaksky stratovolcano is the most prominent landmark of the NW-trending Avachinskaya volcano group, which towers above Kamchatka's largest city, Petropavlovsk. Erosion has produced a ribbed surface on the eastern flanks of the 3430-m-high volcano; the youngest lava flows are found on the upper W flank and below SE-flank cinder cones. Extensive Holocene lava fields on the western flank were primarily fed by summit vents; those on the SW flank originated from flank vents. Lahars associated with a period of lava effusion from south- and SW-flank fissure vents about 3900-3500 years ago reached Avacha Bay. Only a few moderate explosive eruptions have occurred during historical time, but no strong explosive eruptions have been documented during the Holocene. Koryaksky's first historical eruption, in 1895, also produced a lava flow. Gordeev E I, Senyukov S L, 1999. Renewal of seismic activity on Koriaksky volcano in 1994: hybrid seismic events and their use for volcanic hazard assessment. Volc Seism, 20: 507-524 (Enlish translation). Gordeev E I, Senyukov S L, 2003. Seismic activity at Koryakski volcano in 1994: hybrid seismic events and their implications for forecasting volcanic activity. J. Volcanol. Geotherm. Res., 128: 225-232. Hantke G, 1962. Ubersicht uber die Vulkanische Tatigkeit 1957-1959. Bull Volcanol, 24: 321-348. Melekestsev I V, 1996. 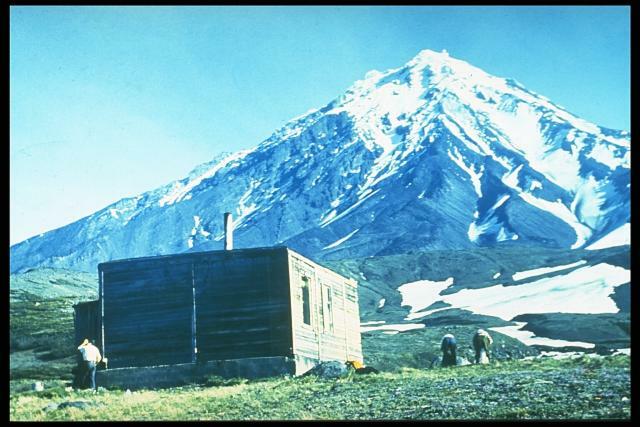 Koriaksky volcano, Kamchatka: eruption of 1895-1896 was a misinterpretation. Volc Seism, 18: 237-242 (English translation). There is no Deformation History data available for Koryaksky. The large symmetrical Koryaksky stratovolcano is the most prominent landmark of the NW-trending Avachinskaya volcano group, which towers above Kamchatka's largest city, Petropavlovsk. 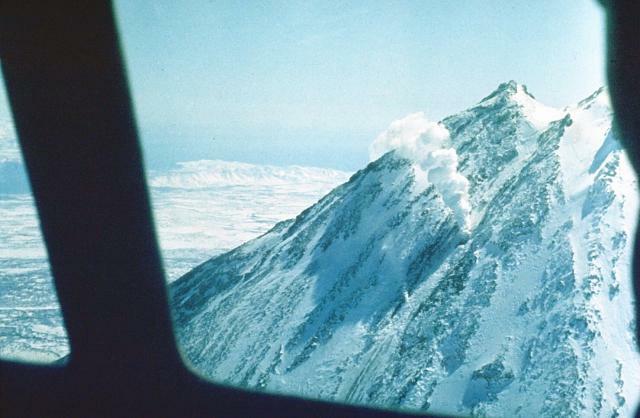 This view from below the saddle between Avachinsky and Koryaksky volcanoes shows the erosionally produced ribbed surface of the SE flank of 3456-m-high Koryaksky. The youngest lava flows are found on the upper western flank and below SE-flank cinder cones. Only a few moderate explosive eruptions have occurred since the first historical eruption in 1895. Koryaksky is the largest of a group of stratovolcanoes surrounding Avachinsky bay. The 3456-m-high stratovolcano is seen here from the south. Koryaksky and its neighbor to the SE, Avachinsky, are popular recreational destinations from the city of Petropavlovsk. Photo by Oleg Volynets, 1989 (Institute of Volcanology, Petropavlovsk). An aerial view of the summit of Koryaksky volcano shows a prominent NW-flank fumarole that has remained active since a 1956-57 eruption. Explosive activity took place from the partially destroyed summit crater (which forms the notch at the upper right) and a radial fissure, which extended from 3100 to 3000 m altitude on the upper NW flank. The eruption began in December 1956 and reached its peak in late January, when the strongest ash eruptions occurred. 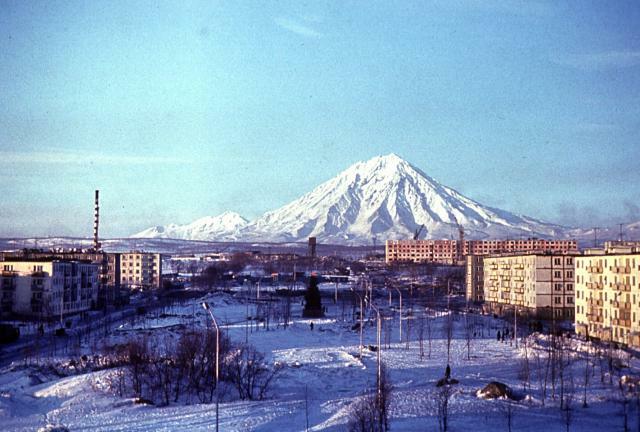 Koryaksky volcano is viewed here in mid-winter from the Institute of Volcanology in Petropavlovsk, looking north down Piip Boulevard. The eastern flank of the volcano is cut by deep radial valleys exposing basaltic-to-andesitic lava flows that form much of the volcano. Koryaksky is located along a NW-SE-trending volcanic chain beginning in the NW with the Pleistocene volcanoes of Aag and Arik, which are visible on the left-center horizon. 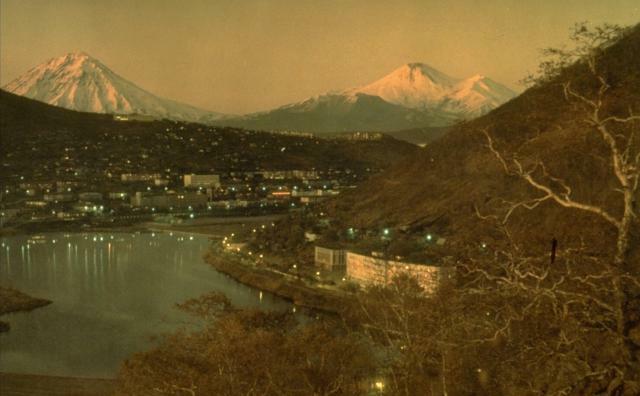 Photo by Vera Ponomareva, 1997 (Institute of Volcanic Geology and Geochemistry, Petropavlovsk). There are no samples for Koryaksky in the Smithsonian's NMNH Department of Mineral Sciences Rock and Ore collection. Large Eruptions of Koryaksky Information about large Quaternary eruptions (VEI >= 4) is cataloged in the Large Magnitude Explosive Volcanic Eruptions (LaMEVE) database of the Volcano Global Risk Identification and Analysis Project (VOGRIPA).